Registration for 2019 will open this summer. Please check back then! Many Faces will take place at the Earle Brown Heritage Center. A reduced-price room block will open at the Embassy Suites Hotel once registration opens. Please contact Lainey Rodgers for assistance with hotel reservations. Student registration closes on October 9th, 2019. To apply for a scholarship, email manyfaces@mnachc.org. Scholarship applications are due by Wednesday, September 18th. Recipients will be notified by Wednesday, September 25th and will have until October 9th to register using the scholarship. Refunds are allowed up to Early Bird date, minus a $50 processing fee. 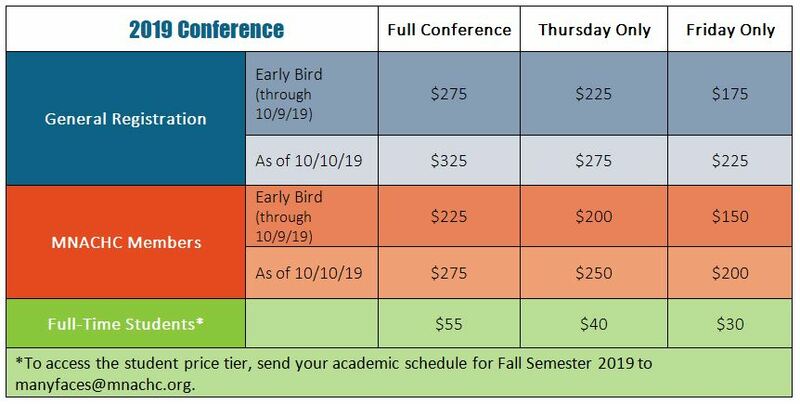 If after Early Bird date, you can send someone else in your place but have to inform our conference staff at least two days before the conference. Monetary refunds will not be given after the Early Bird date. Those requesting media registration must be currently employed by a publication or news organization and provide a business card and/or a letter of assignment. Inquiries must be made prior to October 27, 2019 to manyfaces@mnachc.org. Media representatives must pre-register to be given special consideration.